Can the court rescue Philly's cab industry from Uber and Lyft? 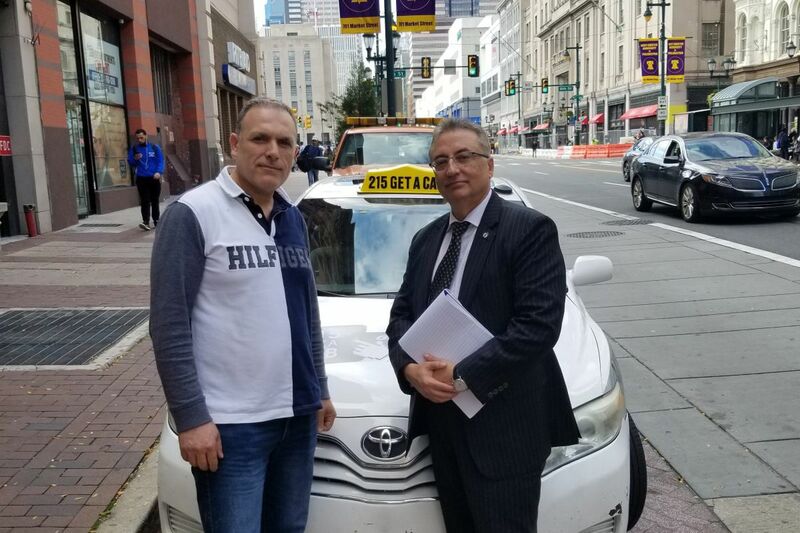 Cab driver Pierre Haifa (left) was only netting $25,000 as a taxi driver when Melrose Credit Union loaned Haifa and a partner most of the $900,000 it cost to buy two Philadelphia cab medallions. Now Melrose is calling in many taxi medallion loans and Haifa’s lawyer, Eli Gabay (right), who represents 30 cab companies, is trying to come up with a resolution. Nearly 10 years ago, as the recession deepened, Philadelphia homeowners by the hundreds and later by the thousands were facing foreclosure. Mortgage companies were calling in loans that in many cases were made to buyers who couldn't repay them, let alone withstand the strain of unemployment, illness, or divorce. People were on the verge of losing their homes even if they caught up on payments, because they couldn't afford penalties or fees to halt the foreclosure process. Into the breach stepped Annette Rizzo, a Common Pleas Court judge, who delayed sheriff's sales and used her position to order bankers and homeowners to negotiate. Her efforts halted at least 1,400 foreclosures, delayed many more sheriff's sales, and became a model throughout the United States. She was even invited to the White House. On Friday, at the "suggestion" of Common Pleas Court Judge Gary S. Glazer, lawyers involved in Philadelphia's taxi industry met in a City Hall courtroom to begin Round One of negotiations to create a similar program over loans made to finance taxi medallion purchases. Citing the court's role in the mortgage crisis, Glazer made his suggestion at a hearing Tuesday involving "confessions of judgment" filed against 81 local medallion owners by Melrose Credit Union of Briarwood, N.Y., lawyers said. The confessions, unless Glazer strikes them, allow the credit union to act immediately to force the medallions into auction and seize the medallion owners' assets. In October 2013, before UberX and Lyft entered the market, taxi medallions were selling for $530,000. Any local medallion owners, who continued to refinance as medallion prices went up, owe from $300,000 to $500,000 per medallion. These days, medallions are worth $52,000 and falling. "Many of these people will lose their homes," said Eli Gabay, a Center City lawyer who represents 30 cab companies that collectively own 50 medallions. Melrose's loan portfolio got so bad that in February, the New York state Department of Financial Services took it over, citing "unsafe and unsound conditions at the credit union." Melrose is also a major medallion lender in New York City and Chicago. If their medallions and vehicles are seized, the cab industry may disappear, Gabay said. He said that in court Tuesday, the judge reminded the lawyers that "these are real people with real lives." Gabay said before the meeting that he hoped Melrose would withdraw the confessions of judgment at least for a time, so some settlement can be reached. Or maybe, he said, it would allow owners to walk away from debts they could never repay. Melrose did neither, Gabay said later, although the credit union did agree to participate in a program, yet to be defined. Meanwhile, the owners can't borrow money for any purpose, said Jeremy Abay, a lawyer who represents other medallion owners. Mediation, Abay said, could help. The judge and the Philadelphia Parking Authority, which regulates cabs, declined comment. Melrose's attorney, Marc Bogutz, did not return calls. Pierre Haifa, who, with a partner owes nearly $900,000 on two medallions, is hoping for a positive outcome. When he and a partner borrowed the money in 2013, each was netting about $25,000 per year driving a cab. Haifa, of South Philadelphia, was banking on selling the medallions later as prices rose. Gabay said that when Melrose made the loans, its executives knew that Haifa and his partner would never be able to repay them. By earning fees, "they made money on making these huge loans to people who would not otherwise have qualified," Gabay said, banking on medallion prices' continuing to rise. Like many others, Haifa stopped paying "because I could no longer afford the payments," he said. Now, Haifa, who is married and has two children, drives his cab 15 hours a day, six days a week, and barely nets $10,000 a year. "It's very, very stressful."